Teenage Mutant Ninja Turtles Adventures was a comic book series published from August 1988 to October 1995 by Archie Comics. It is mainly based on the stories of the mutant turtles Donatello, Leonardo, Michelangelo and Raphael, their rat sensei Splinter. It is set an alternate universe. The initial story lines were close adaptations of the TMNT 1987 TV series, but by the fifth issue Eastman and Laird handed the series over to Ryan Brown and Stephen Murphy who introduced new stories and characters distinct from the show. In their hands the comic immediately diverged from the cartoon series into unique new story arcs, often incorporating social, environmentalist, and animal rights themes. The series are often seen as "deeper" and more "serious" than the cartoon. The series was ground-breaking for a children's comic book and developed a strong fan base. 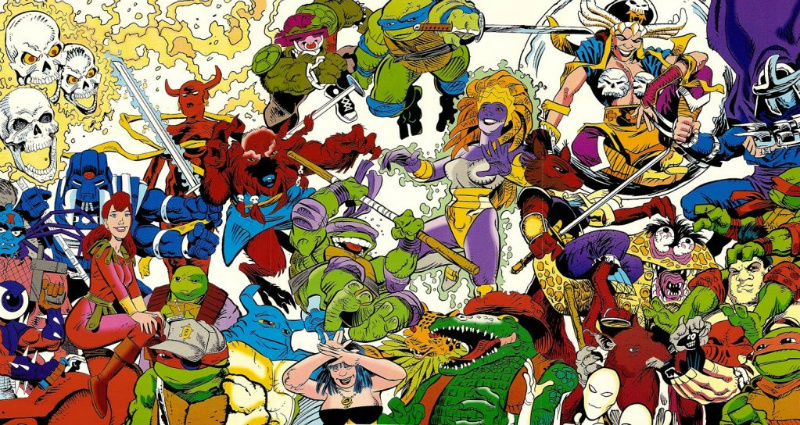 The original series rogues gallery, Krang, Rocksteady and Bebop were eventually phased out completely early, whilst Shredder remained a recurring adversary.